A beautiful smile can do wonders for a person both inside and out, and the opposite can be said if someone constantly feels self-conscious about their teeth due to noticeable stains, chips, cracks, or gaps. 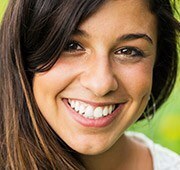 At Cochell Family Dentistry in Salem, we help patients achieve their dream smiles every day using our selection of cosmetic dentistry services. Teeth can easily be whitened, reshaped, or completely transformed to create a beautiful and natural look. What would you like to change about your smile? We can make it happen, all you need to do is contact us today. 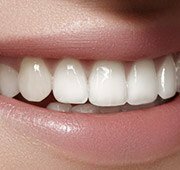 A veneer is an extremely thin ceramic shell that is bonded to the front of a tooth to fix imperfections, and they are always custom-made. So, you can get just one or an entire set to makeover your smile. The choice is up to you, and we know you’ll love the results. 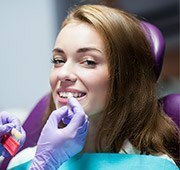 When we’re tasked with repairing a tooth that will show prominently in a patient’s smile, we review the different dental materials available and recommend one that will restore both function and esthetics. This enables the patient to make an informed decision as some materials provide more esthetics or more function depending on the tooth/area. Simple esthetic restorations include composites which are tooth-colored resin fillings. More complex esthetic restorations include porcelain, zirconia or a combination of porcelain and lithium disilicate. These are used to restore inlays, onlays, crowns, bridges, and implants. These materials are strong, durable, and known for their ability to replicate enamel, even down to how it reflects light. With these esthetic materials, our doctors can create restorations so lifelike that even our patients have trouble telling them apart from natural teeth! Minor chips, gaps, and stains can all be addressed with very little time using direct bonding. This involves using tooth-colored resin filling material - known as composites, along with the bonding agent – adhesive, to form a chemical bond with enamel. 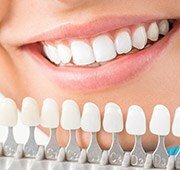 Our dentists can apply tooth-colored resin to damaged or missing enamel, sculpt it to match the lost tooth structure and bond it in place to form a strong, esthetically pleasing restoration. After adding a nice polish, it can be difficult to tell where the problem existed. This treatment is usually fast, painless, and the results can be expected to last several years with good home care. Wouldn’t it be nice if you could sit back and relax at home as your teeth changed shades to become whiter? With our Opalescence take-home kits and Sheer Whitening Strips, that’s exactly what you can do! These treatments are excellent at removing extrinsic stains due to coffee, wine or tobacco. These kits use the same active ingredients as products you can buy at the store but at higher concentrations. 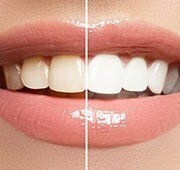 To remove stubborn extrinsic and even intrinsic (deep within enamel) stains try our custom whitening trays or our most effective, “in-office” whitening treatment. These whitening agents use either carbamide peroxide or hydrogen peroxide at specific concentrations to penetrate through the enamel surface. Oxygen molecules from the whitening agent then react with the stained molecules to break them down. Once this process spreads across the entire tooth surface, the enamel changes shades giving you a dramatically brighter smile in a relatively short period of time. 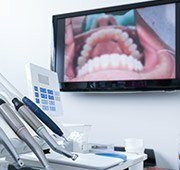 Using intra-oral and extra-oral cameras we give you a detailed, expanded, look into your mouth to visually see where changes may be made to improve both esthetics and chewing function. Imaging also gives the patient a chance to ask questions about things they may not have noticed at home. We also use digital imaging in the form of x-rays. Gone are the days of traditional exposure film which was tedious, uncomfortable and time consuming to take and process. The new era of x-rays provides for quick exposures, with a full mouth only taking minutes to complete and instantly appears on the computer monitor next to you. This technological advancement also comes with the added benefit of about 70% less radiation than traditional film x-rays.